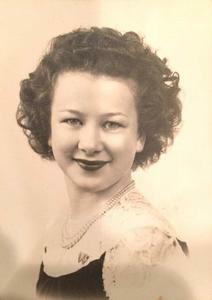 Dorothy Jean (Coale) Clement went home to be with her Lord and Savior on October 29, 2017 at Orchard Creek Assisted Living in Traverse City, Michigan, just shy of her 90th birthday. She was born December 5, 1927, in her paternal grandparents’ log cabin in Burnt Prairie, Illinois to Elden and Marie (nee Vaught) Coale. They moved to Flint shortly after she was born to live with her maternal grandparents and so her father could pursue employment in the newly developing car industry. He became employed at Fisher Body and was instrumental in the formation of the UAW. In one of the most significant events in labor history, Elden was both an organizer and participant in the Flint Sitdown Strike at Chevrolet in 1937. He is one of a select few who remained inside Fisher One for the entire 44 days of the strike, which culminated in General Motors recognition of the UAW. Dorothy and her mother used to sneak food into the plant for the strikers. Dorothy loved music and beginning at the age of 2, she sang on the radio, at dance marathons, walkathons, and anywhere else there was an audience. She was so little that she had to stand on a fruit crate to be tall enough to reach the microphone. Her Aunts taught her to sing four-part harmony; she subsequently joined the choir of every church she ever attended. Dorothy composed both the music and lyrics to dozens of songs. She attended elementary and junior high school in Holly and Flint; she graduated from Flint Tech High School in 1945. On Valentine’s Day, 1947 (one of her favorite holidays), she married her high school sweetheart, Lloyd F. Clement, at the Central Methodist Church in Flint. Mrs. Clement was passionate about children and family. She worked for the Michigan Children’s Aid in Flint and served as Chairperson of the March of Dimes to support children with birth defects. She loved to teach and was superintendent of Sunday School for the First Baptist Church in Holly for many years. Mrs. Clement was known for her sewing and knitting skills and also taught candy classes for years in St. Ignace. There was not a craft she didn’t like or learn. She is survived by her children and their families, Steven (Pamela) Clement of Colorado Springs, Colorado; Tim Clement of Traverse City; Deborah (Rodney) Spencley of Mountain View, California; Diane (Bill) Conklin of Traverse City, and nine grandchildren. (Michael John Clement, Curtis Clement, Laura Jones, Jillian Clement, Andrew Spencley, Adam Spencley, Nathan Spencley, Briana Conklin, Will Conklin, Caleb Conklin, Christian Spencley, Heather Spencley, (4 great grandchildren and 5 great, great grandchildren). She was preceded in death by her husband, parents and a grandson, Brian Clement.